A Pong game with yet another twist on the genre! Pong is like the fruitfly of the gaming world! Why? Well, because it is so simple, and yet, with just the simplest of additions it can shift and be twisted to create a very different experience. I mean, in 2012 there was this bundle of indie Pong like games, some that played turn based, some other that were imagined as text based adventure (yes, I'm not kidding!) and others that played automatically. Basically, Pong could be used to demonstrate the importance of design and how much difference even the smallest of details and design choices or lack of theme thereof) could have on the player. 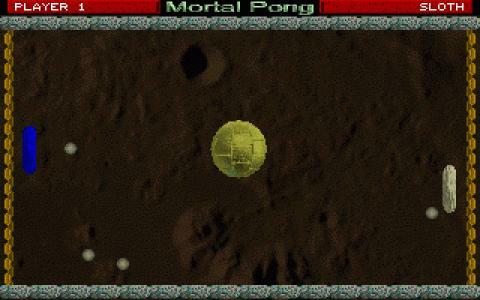 Anyway, what Mortal Pong does, is to add new elements to each pong reprise, all the time, with each new level. Thus, the core game, while the classic one, you using your pallet to shoot the ball and not allowing it to slide in your side, is still there. But the small differences will surely change the way you look at Pong. Because the Death Star wants you, that's why! Don't think that the game ties in to Star Wars more than through the (more or less!) nondescript Death Ray center of the table, but you'll be amazed at how much that shifts your gameplay style and attention. So, yeah, a different Pong game, though still a Pong game, for those that want more than just the vanilla experience!